yCal is a calendaring app to help keep the overview on a whole year. 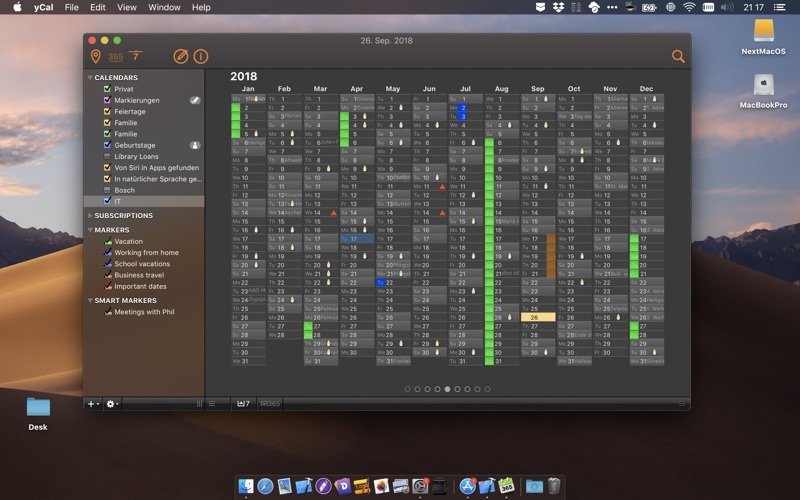 It features a unique “months by column” year view in addition to the more conventional week views, provides ample marking and note taking options, and central holiday and birthday management. yCal has been designed from the ground up to make a better desktop calendar. Its unique year view gives you the perfect overview in a fraction of a second. 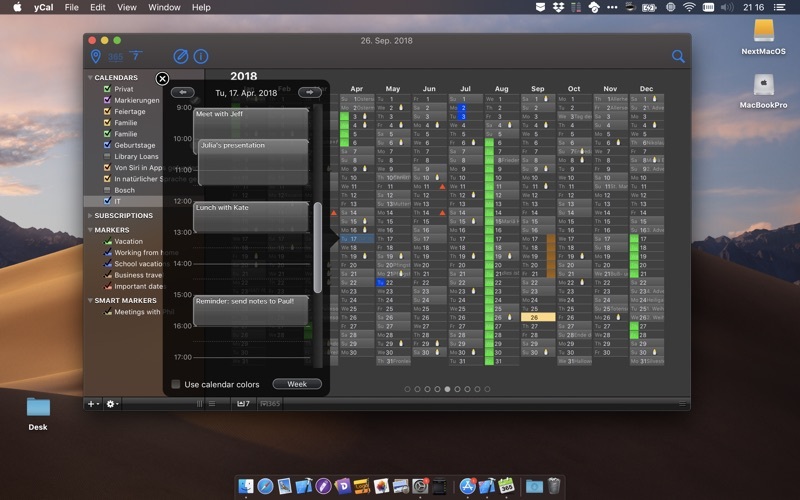 Days can be marked in different colors and styles to give you more information in one picture (e.g., to show days of vacation, times of travel etc. )- just like on a normal paper calendar. The full year can be shown side-by-side with the week view, giving you more fine granular access to individual events. Everything is optimized for giving you access to powerful features with minimum user interface overhead. For example, just hit space in the year view to quickly look at the details of a selected day. Or just start typing to add a note. Swipe left or right to scroll through years and weeks. 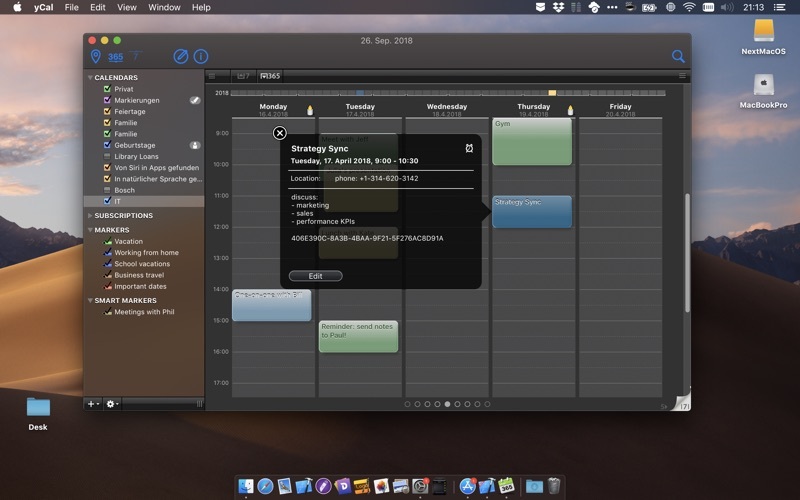 yCal seamlessly integrates with calendars set up in OS X- there is no proprietary data store. 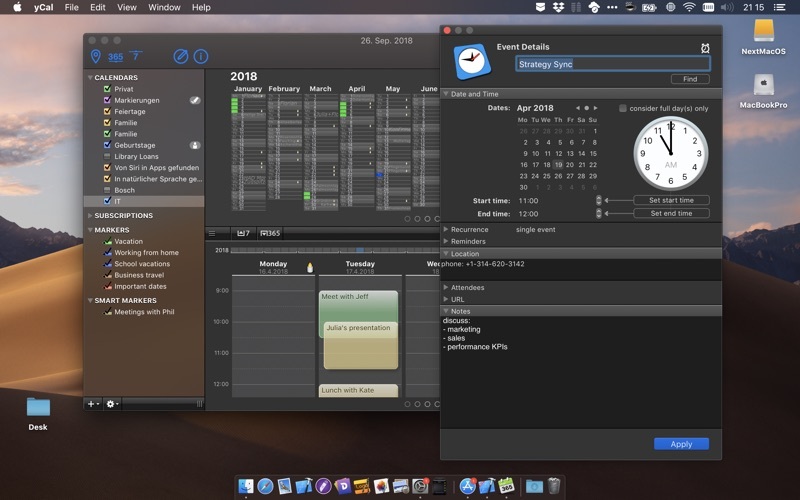 yCal operates on your local machine’s calendars, and if you run Apple’s iCal or Calendar app in the background, you also have access to data from your CalDAV servers, iCloud, or from wherever else without the need for importing or copying. 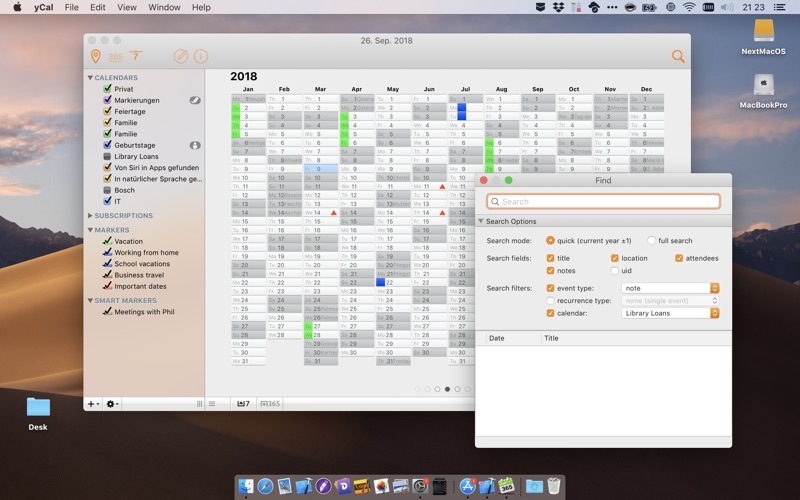 Note that yCal does not provide native CalDAV access to calendar servers as of today, but you may use Apple’s iCal or Calendar app to sync yCal data with those calendar servers. (Native CalDAV support is in the works for an updated version of yCal). The biggest overhaul since a few years! We updated yCal to fully support and take advantage of the newest version of MacOS, including support for dark mode and accent colors. 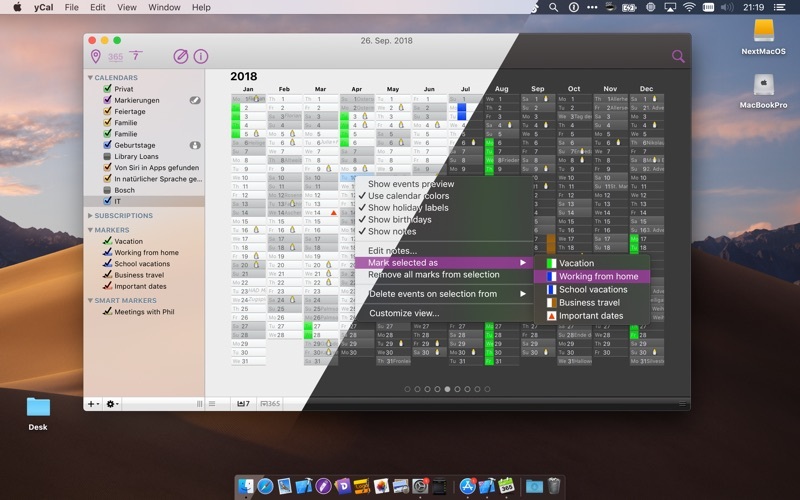 Along the way, we optimized the calendar access to be more stable, optimized scrolling and swiping in the different views, optimized window redraw during scrolling, swiping, and resizing, optimized notes and day previews, and improved the overall stability.